So, we work in a field where strength based rehabilitation is paramount and in many conditions from Osteoarthritis to tendinopathy rehabilitation has been shown to be superior or at least as successful as surgical intervention yet we struggle with innovation. Studies dabble between concentric versus eccentric, slow versus fast and the trend flip flops between each. We know strength is the way to redistribute load between segments, yet we need to allow time to gain those properties. It is unrealistic to expect a patient to gain a 1 or 1.5x ther bodyweight Deadlift in the management of their chronic back pain with no training history in 6 weeks, if they are aiming for a 80 Kg lift and start at 20 Kg. We know the health benefits of muscle mass in reducing chronic inflammation and the MRI image of a trained versus untrained triathlete 80 year old is infamous, but sshh, we don’t really want our patients to know that strength training, muscle mass and or the lack of it seems to be the underpinning concept behind much of what we see in sports medicine. If they all get strong then we would be out of a job. But where orthopaedics are searching for stem cells and biologic agents to reverse degenerative properties in cartilage, it has spawned the ‘opportunistic sell’ on products with litle to no evidence, but yet are being vaunted as the finished product. But science already exists to support methods of increased muscle mass in the world of sarcopenia – yet we are unable to explore them because of WADA and anti-doping rules. If we need to change a patient’s strength post total knee replacement or post ACL reconstruction, why do we not look to existing science? When strength restoration is the rate limiting step in many conditions, why is innovation not pushing us down a route that may avoid unnecessary surgery? If we can make the posterior chain stronger and adapt the anterior pelvis angle with muscle, it might make FAI surgery less the supposed quick fix, and rather a ‘sell’ with less evidence. Can we use anabolic agents legally, to expedite rehabilitation gains where strength is the variable of most effect? A new paper by Morton Hostrup and the same group really caught my eye. He looked at 77 trained male subjects. Participants were randomly allocated to daily inhalation of beta2–agonist Terbutaline (8 x 0.5 mg, Bricanyl. Turbohaler, AstraZeneca, Cambridge, UK) or placebo. A full-body program 3 times weekly. All training sessions were supervised by an instructor and consisted of 8 exercises until failure. Resistance was adjusted continually so failure occurred at ~10-12 repetitions. The training program was progressive, as each exercise consisted of 2 sets in the first week, 3 sets in the second and third week, and 4 sets in the fourth week. The training program consisted of leg press, bench press, knee extensions, military press, lunges, lat pulldowns, laying leg curl, and low row. Each set was separated by 2-minutes recovery. Cycling to work, football, own gym. 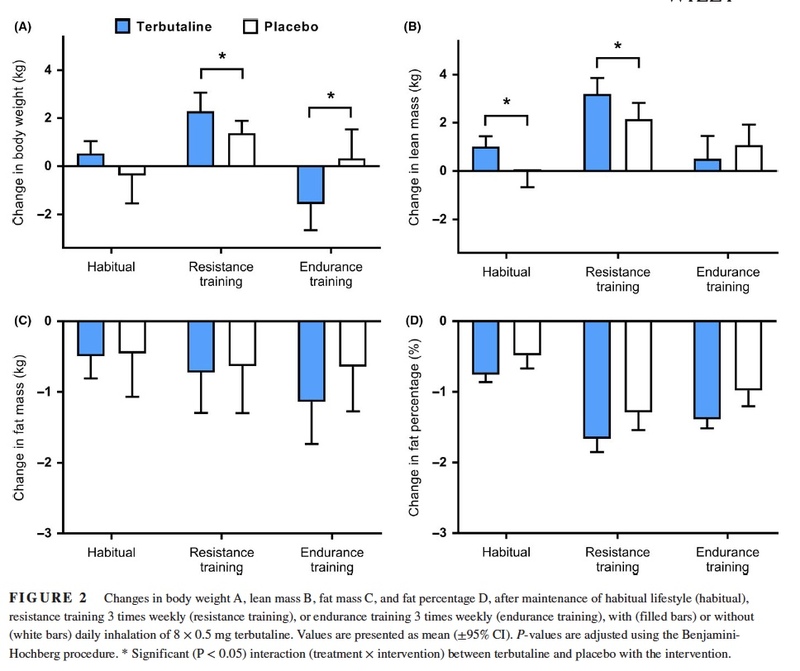 Terbutaline increased lean body mass by 1.03 kg (95% CI 0.29-1.76; P < .05) and 1.04 kg (95% CI 0.16-1.93; P < .05) compared to placebo in the habitual and resistance training group, respectively, but had no effect compared to placebo in the endurance training group [-0.56 kg (95% CI -1.74-0.62; P > .05)]. Remember this is in 4 weeks with the use of a WADA approved dose. As the author highlights , it is on the slightly higher use side, but still legal. The study is well designed, with supervised drug dosage via Skype, a detailed resistance and endurance intervention and repeat DEXA Body composition and metabolic measurements through the 4 week period. Whether the effects are prolonged past the 4 week period, or whether they are equally impressive in untrained individual’s or women is highlighted again in the discussion but still impressive results in a short period of time. Fat mass, bone mineral content, and resting metabolic rate did not change differently between treatments with the intervention. Side effects were reported and a reason for drop out in both placebo and treatment arms. If our patients are struggling to gain strength post surgery or if strength is a key component of their rehabilitation, rather than worry about slow eccentrics or heavy isometrics, should we not just be concerned with Strength as a %BW 1st and foremost then about reactive and rate of force development? If so, then does pharmacology offer a untapped opportunity to improve rehabilitation outcome? If rehab is shorter and cheaper and avoids surgery should an outcome measure of %BW strength be the most important variable?